New Holland is the former embarkation point for the London & North Eastern Railway's ferry service to Victoria Pier, Kingston upon Hull. The service was operational from 1820 to 1981, when the Humber Bridge opened. There were three LNER built paddle steamers used on the route: the PS Tattershall Castle, now a London pub and restaurant moored at the Embankment, the Lincoln Castle which served a similar purpose at Grimsby until 2006, and has since been scrapped, and the PS Wingfield Castle, which returned to Hartlepool where it was built, and where it is now a museum ship. The port of New Holland handles mostly bulk cargo in two locations: first, the small tidal dock, built about 1848 with the coming of the railway, and second, New Holland Pier, the former terminal for the ferry to Hull. The tidal dock is almost entirely used for the import of timber from Scandinavia, Russia and the Baltic states, particularly the ports of Hamina (Finland), Kalmar (Sweden), St.Petersburg (Russia), Tallinn (Estonia) and Riga (Latvia). Occasional imports of steel products come from the near continent. The tidal dock generally only accommodates one vessel at a time. New Holland Pier, with berths for three ships, is capable of accommodating larger vessels through its location in the deeper part of the channel. Since the early 1980s it been used for the import and export of bulk cargo between the UK and parts of Scandinavia and Europe, the Black Sea and North Africa. The village and port is served by New Holland railway station. 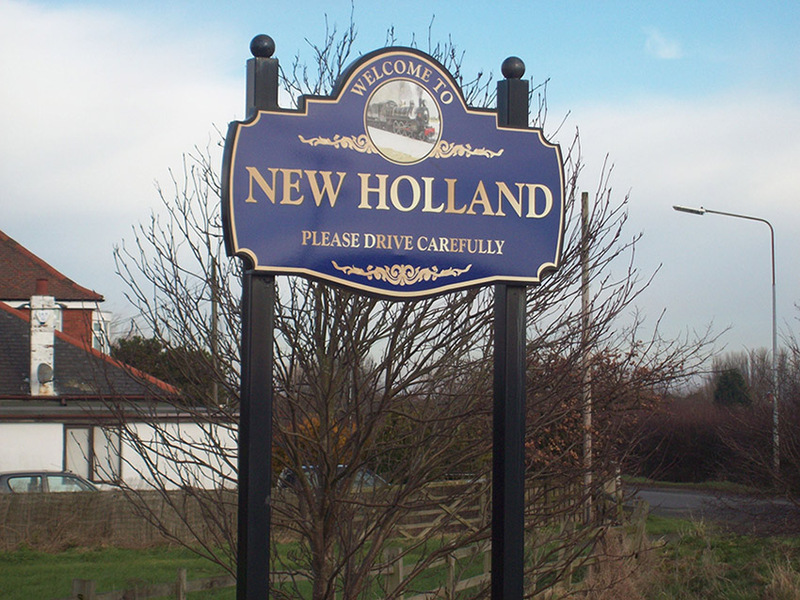 © New Holland Parish Council. All Rights Reserved. Design by Vision ICT Ltd.